It is amazing how adding this frosted glass decal has made the office AND the officers feel more professional. You and your company did a fantastic job! Whether it is a simple floor display such as this or you are looking for something more elaborate we can design, develop and manufacture it for you. 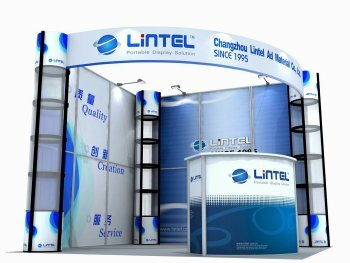 Providing you with an easy to assemble and easy to ship trade show display or booth can save you thousands of dollars. We specialize in all types of displays. Whether you are looking for a simple banner stand or a complex island display with LED TVs and lighting we can produce a solution that helps you stand apart from the competition. We are creative and are constantly researching the market and new technologies when it comes to display systems. We will find and design a solution that you will love! 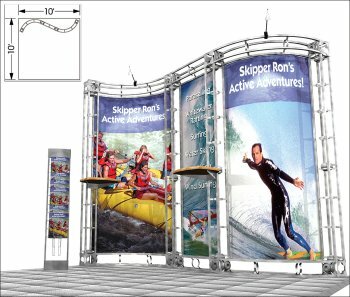 As we've mentioned in our section about banner stand displays, trade shows are a very powerful marketing tool. Trade shows have exploded over the last few years and everyone is looking for that dynamic solution that will show off their capabilities. The value of trade shows is they allow you to get in front of many more clients than you could ever hope to meet in a year's worth of sales calls, all in the space of a few hours! The only drawback of trade shows is that you have a very short period of time with which to make a lasting impression with your prospective clients. This is where our displays come in. Since you've only got a few seconds to make a great first impression this is where your carefully crafted graphics can help you grab their attention. Your clients will remember your personality and what you offer, but they will also remember that first impression that they got when they looked at your display! Get it right with the Visual Edge Signs & Design, Inc. and let us help you close those deals today.